Maladine the Great was a mighty kingdom that existed over one thousand years before the events of the Desolation War begin. The realm was vast, encompassing most of the known world. The association of the kingdom as a universal power has lent the name to the continent that was its home; thus, the lands of the Remnant Kingdoms, the Necromancer Kingdoms, the South Lands, and the North Lands are collectively said to reside in the world of Maladine. 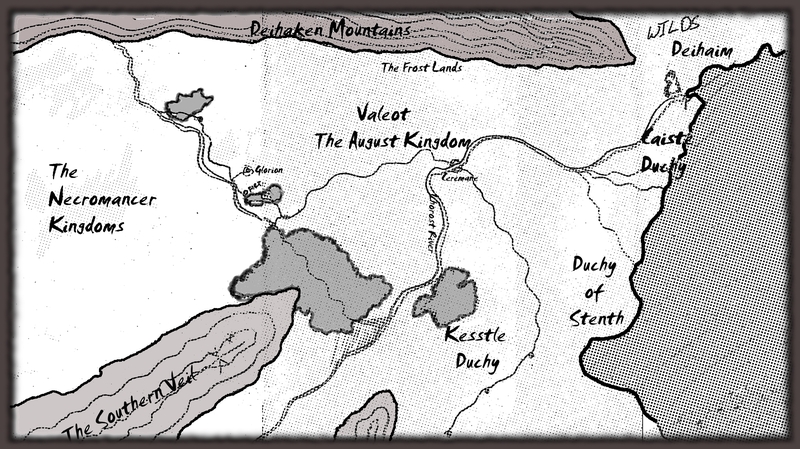 The map on this page is the most common rendition of the reaches of Valeot, the last of the Remnant Kingdoms. West of the Vendehar River (and the mountain range called the Southern Veil) is the Necromancer Kingdoms. There was once five other kingdoms that separated Valeot from the powers that reign in Mahakir (the capital of the Necromancers). These have all fallen over the millennium to the voracious appetite of Mahakir. Some older maps that show these now dead kingdoms will be posted here in the future.